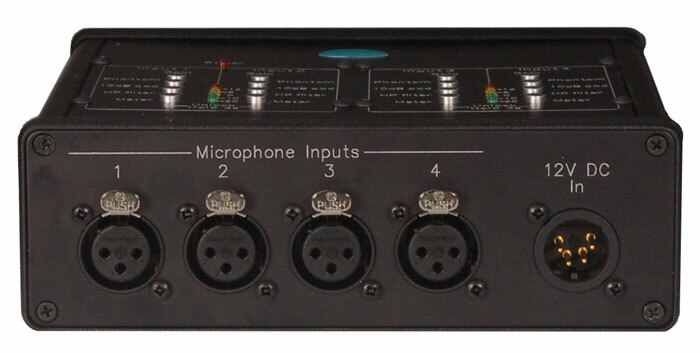 This dual mono or stereo DSP controlled microphone amplifier was originally designed to be mounted on a camera but may be used anywhere a good quality mic amp is required. 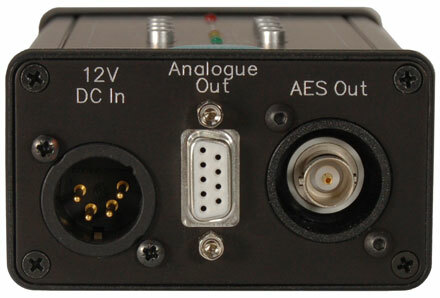 The mic amp outputs are available simultaneously as analogue or unbalanced AES . 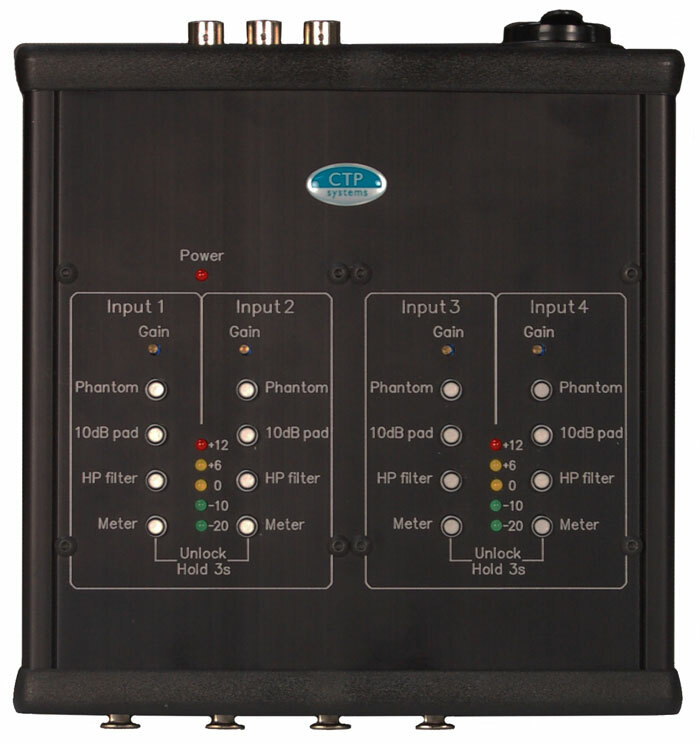 Each mic amp each has a gain range of +30dB to +60dB with a switchable 10dB pad available. 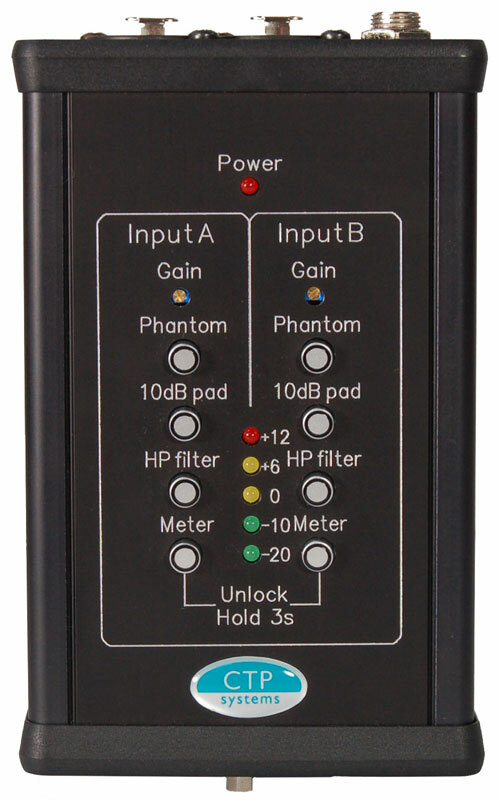 Phantom power (48volts) may be selected to either or both microphones. There is a high pass filter for dealing with those windier locations. Each microphone's level may be checked on the built in LED meter and may be monitored via the headphone jack. All settings except gain are push button and are held in memory. The buttons auto-lock after 3 minutes. 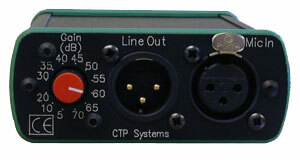 Power requirements are 12 volts DC supplied via the 4 pin XLR. This quad mono or dual stereo DSP controlled microphone amplifier is perfect for 'piggy backing' remote audio onto HD-SDI video. 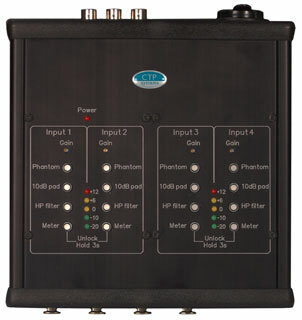 Simply plug this unit in series with the video stream. The four mic channels are assigned to channels 1-4. 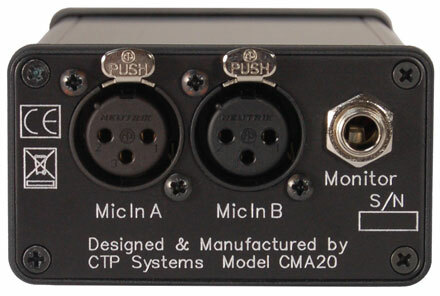 Features of the unit are similar to the CMA20, each mic amp has a gain range of +30dB to +60dB with a switchable 10dB pad available. 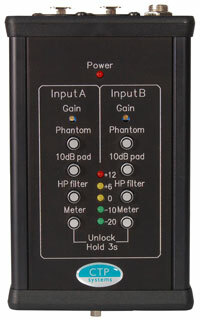 Phantom power (48volts) may be selected to either or both microphones. There is a high pass filter for dealing with those windier locations. All settings except gain are push button and are held in memory. If not manually locked, the buttons auto-lock after 3 minutes. Power requirements are 12 volts DC at around 750mA supplied via the 4 pin XLR. This small high quality mic amp, with 48 volt phantom power, is the perfect answer to all those problems caused by sending low level microphone signals over long cable runs or just where a local, portable microphone amplifier is required. The MAB48 has switchable gain from +5dB to +70dB. Phantom power may be off, +12 volts or +48 volts. 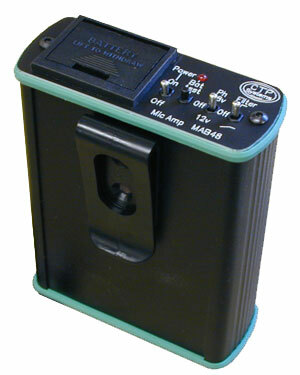 If the microphone permits, use of 12 volt phantom power will extend the life of the single PP3 size battery. An alkali battery is recommended. There is a built in high pass filter which may be off, set to gentle roll off or to hard cut for windy environments. A battery test switch warns of low battery life. The unit is housed in a tough aluminium case and fitted with a belt clip.